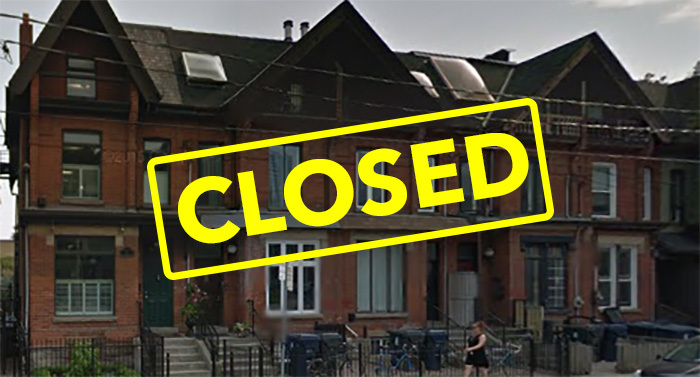 (LifeSiteNews) – Toronto’s Scott abortion facility, run by abortionist Robert Scott and his wife Maria Corsillo, is “closing its doors after 29 years,” according to an announcement on its website. “Yes, we are closed,” a Scott Clinic staff person verified in a telephone call from LifeSiteNews, but refused to say why. The staff member said only, “I have no idea who you are, or why you would be calling with such a question, thank you for calling us,” before hanging up. It is rumored that the reason for the closure is abortionist Scott’s retirement. Pro-lifers stage a sit-in at the Scott abortion facility.Courtesy of The Interim. Gibbons estimated that she’s been arrested at least 10 times in front of the Scott abortion facility for breaching the 1994 injunction that prohibits pro-life demonstrations and sidewalk counseling within 500 feet of Toronto abortion facilities. She was most recently released January 21 after her September 2 arrest in front of the Morgentaler abortion facility. Instead, people should remember “how many people lost their lives, how many Canadian little ones expired at this location, to do honor and respect to their deaths,” Gibbons said. Scott and Corsillo started the abortion center on 157 Gerrard Street in 1986 – when operating a free-standing abortion center was a criminal offense. Scott, in fact, had been arrested three years earlier in Winnipeg along with abortionist Henry Morgentaler after opening an illegal abortion center there, relates an online history of Morgentaler, Canada’s most notorious abortion campaigner. Scott, Morgentaler, and abortionist Les Smoling (who operated an illegal abortion center in Toronto from 1965 to 1968) also opened an illegal abortion center in Toronto in 1983, which police raided that year, charging the three with conspiracy to procure a miscarriage. A jury acquitted the trio in 1984, and while the Ontario government appealed that decision, Scott was arrested in 1986 – five months after opening his own illegal abortion facility, but Ontario’s attorney general ultimately stayed the charges. In 1988 the Supreme Court struck down Canada’s abortion law in its R. v. Morgentaler decision, in which Scott, Smoling, and Morgentaler are the named appellants. And in 1994, under NDP Premier Bob Rae, Attorney General Marion Boyd brought in a “temporary” injunction to protect the province’s abortionists, while at the same time suing 18 named pro-life defendants. 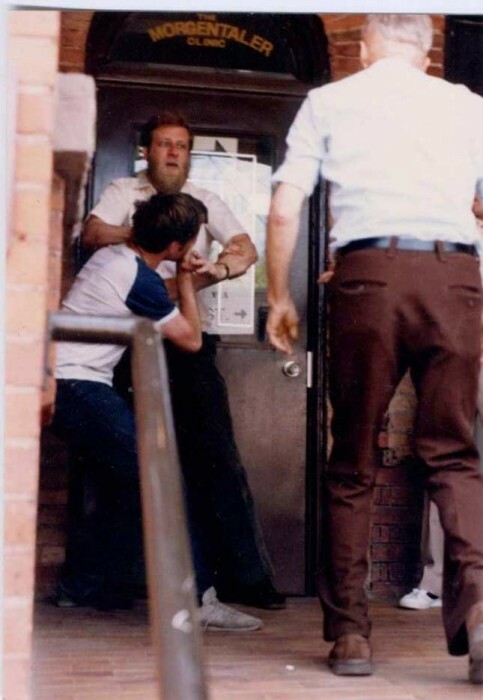 Abortionist Robert Scott in a scuffle with a pro-lifer at the Morgentaler abortion facility, then on Harbord Street, circa 1987. Courtesy of The Interim. The injunction, still in force, prohibits demonstrations, picketing, and sidewalk counseling within 500 feet of the entrance of Toronto abortion centers. It is generally thought the NDP’s crackdown on pro-life advocates’ freedom of speech and movement was prompted by the rise of the rescue movement in Toronto, in which pro-life advocates blocked the doors of abortion centers in an attempt to save women and their unborn children from the violence of abortion. 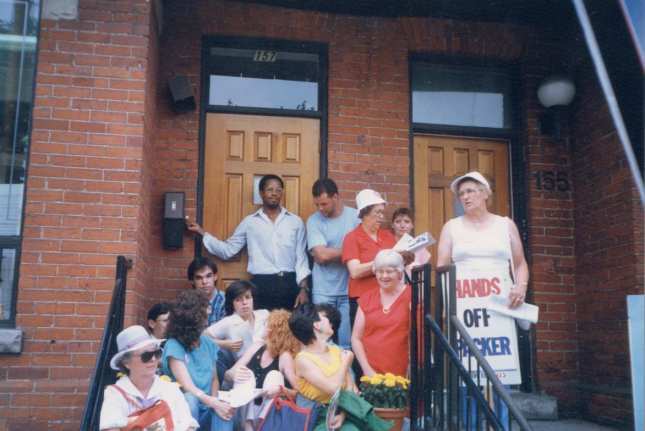 And a 1992 firebombing of the Morgentaler abortion center, then on Harbord Street, was believed to have been a factor in the unprecedented government repression of pro-life activity. While the media portrayed it, without any evidence, as the work of an anti-abortion activist, charges were never laid and the prime suspect was the father of a child aborted at the facility. What Hughes recalled most about the Scott abortion center was the demeanor of the abortionist’s wife, Maria Corsillo. “If we couldn’t have the women reconsider because of the peaceful presence of people there, perhaps because of her behavior, others were frightened away,” he said. Gibbons also remembers Corsillo. “She’d always say ‘I’m the manager of the Scott Clinic,’ she wouldn’t say ‘I’m the abortionist’s wife and the clothes I’m wearing are bought with blood money,’” she told LifeSiteNews. Editor’s note: This article originally appeared at LifeSite, and is reprinted here with permission.